A couple of weeks ago Beth started Joy School! Woohoo! Joy School is like in home preschool but several moms share the duty of teaching. We all take turns teaching in our home and then the off weeks we get off. Its great! I love it so far, of course I haven't had my turn to teach yet, so maybe it won't be quite so wonderful, but so far so good! Beth loves it and is learning a lot. Plus she just loves the social aspect and it teaches her how to play well. She has been doing great! And I can't complain about the 2 hours and 15 minutes I get without her every tuesday and thursday! 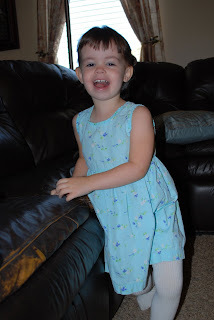 She's growing up so much, its hard to believe she will be 3 next month! How the time flies! I'll be interested to hear how you like it once you've taught! I decided not to do something like this because I wasn't sure what to do with my other kid for the two hours. Ah joy school.... we loved being a part of it. Even the teaching was fun once I got the hang of it and I can't get over how much Olivia matured socially in just that one year. Good luck - I hope she has a great time!